Reach customers through this invaluable direct marketing tool. 80% of retail professionals indicate that email marketing is their greatest driver of customer retention. And nearly two-thirds of internet users have made a purchase because of email marketing. So, contrary to what some might think, email marketing is not dead. Twitter and Facebook didn’t kill it. Spam didn’t lessen its impact. No, despite talk of its premature demise, email marketing is alive and well and works amazingly well, when done right. Email marketing remains a very powerful form of direct marketing. It allows you to target your message, helps to build relationships, support sales through other channels and, more importantly, it’s relatively inexpensive. Email marketing is an easy way to keep your products in front of customers, or potential customers. Even in today’s rich social media environment, email marketing is still an essential strategy for successful websites. At OperationROI, we offer an Email Marketing Service, complete with creating custom HTML emails for mobile and web, to the actual deployment of your campaigns. We also provide detailed reporting that includes open rates, click-through rates, conversion rates, bounce rates, spam rates, among other metrics. By getting your message out and allowing group discussion, you engage the target audience more deeply and get a better understanding of your customer. This allows for refined messaging and expanding your reach to potential customers. With the discussions taking place on social media sites, you have now expanded the reach beyond the opt-in list. This allows for a faster and low-cost source of new opt-in names for future email deployments. It also allows for continual acquisition between email deployments. Social media helps maintain customer retention by allowing ongoing looped communication. This communication allows for deeper engagement and emotional investment by the participants. It also improves the relevance of a particular product, service or brand. Getting your message out and monitoring it on social platforms creates a simple survey/panels type forum for your target audience. This allows the audience to better understand the product or services and the needs of the consumers, good or bad. It also allows for faster PR buzz, again positive or negative. Understanding the good/bad or positive/negative will allow for revised messaging, product modification or improved services in the future. As an advocate of email marketing, OperationROI is a firm believer that this medium is not only here to stay, but an integral part of any marketing campaign. Email deployments are important for marketing any product, service or brand — and we can help you in all phases of strategizing, deployment, analysis and maximizing ROI. Take advanatage of this highly effective digital marketing strategy. Design custom coded email marketing templates that reflect your brand and are easily modified in order to create your email marketing campaigns efficiently. Research target market, customer tendencies, and competitors and develop an email marketing strategy that meets your company’s goals and objectives. 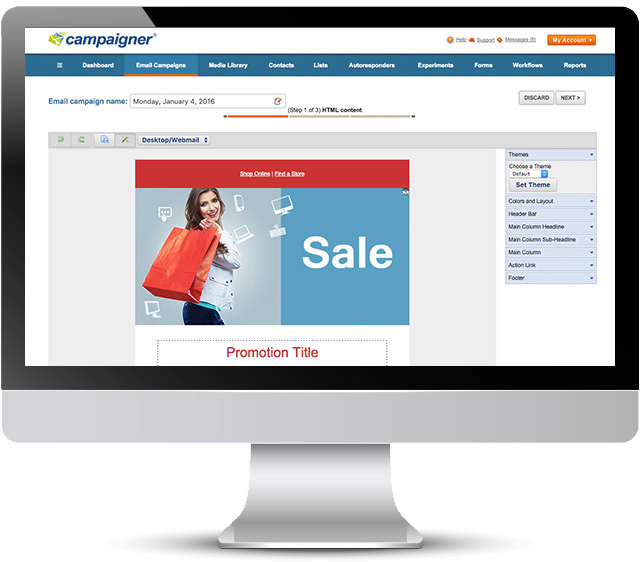 Manage your email campaign deployment process from template and campaign creation to setup, segmentation and message deployment. In-depth analytics data is available to you as soon as your email is sent out. Track results from opens, links clicked, browsers and devices used, GEO location and much more. Test different elements of multiple email versions in order to see which performs best through A/B split test campaigns, then send the winner to the rest of your email list. Segmentation and careful list management to ensure your messages are sent to the right audience, scoring higher conversion rates.